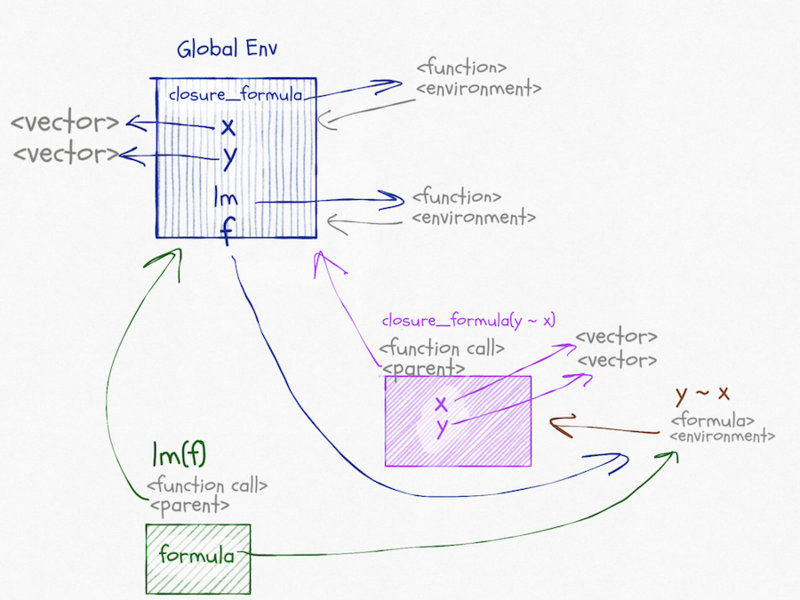 How R finds the bindings of variables by looking through chains of environments. How you can manipulate these environments to evaluate expressions in a non-standard way. How you can evaluate expressions where lists or data-frames overscope variables that would otherwise be found in environments. Functions and formulae have associated environments. They do not have their own environments the way that function calls have, like the one that exists when we call lm(y ~ x), they are just references to other environments. The environment associated with a function is the one that will be the parent of the environment in a function call. It will be the one the function is defined in (unless you change it, which you can). 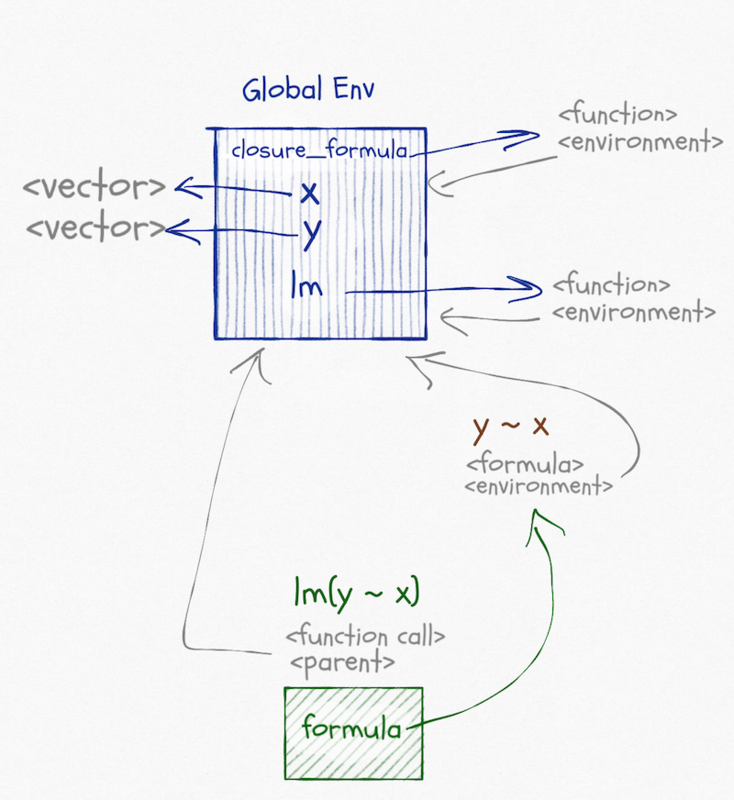 The environment associated with a formula is also the one where the formula is created (unless you change it), but it is just used to find variables that are not over-scoped. When we call lm(y ~ x) we create the formula y ~ x. Its environment is the global environment. When we call lm it puts the formula in its argument, formula, and then it fits a linear model to this formula, based on variables in formula’s environment. Not its own and not its caller’s environment. Well, it is its caller’s environment since it is called from the global environment, but that is a coincidence. It doesn’t use the caller’s environment to look up variables. The formula does not store the variables it contains. If we changed x or y between creating the formula and fitting the model, we would use the new values of the variables. We only use the formula environment to get a starting point for the search for variables. The graph for this call looks like this, and I apologise that it is very busy. But there really is all this going on (and I haven’t even included edges for caller environments). In the call to closure_formula, we create a formula; the environment associated with this formula is the one we create in the function call. When we call lm(f) the situation is similar to before. In lm we will get variables from formula. This time that will be the formula created in the function-call scope. and the other is different. It is the environment of the function call, trust me. This environment contains the variables x and y because we define them inside the function call. If you don’t believe that the environment for the formula is the one from the function call—maybe you think that I am a liar—then we can check that explicitly by printing the environment inside the formula-generating function. That would be a boring example compared to what we have already done, so I will add a twist to it. I will create the formula inside the function call but using a non-standard evaluation. The eval(substitute(f)) makes the argument f into a quoted expression and then evaluates it. We lose the environment associated with the arguent2 but create a formula based on it inside the function call scope. The rlang package exploits this to implement quasi-quotations for tidyeval. You can exploit the formula+environment combination in other ways. For example, purrr uses formulas to make lambda expressions. This functionality involves translating a formula with an associated environment, into a function plus that environment (i.e. a closure). It is when you combine creating functions in this way by non-standard evaluation with quosures you can do brilliant stuff. I don’t have time to write about that here, but my Domain-Specific Languages in R book has some examples. I do not know if you can do all that rlang does with formulae in pure R. The rlang package does call into C several places. I haven’t played enough with this in base R to know how it would be done if it can. I use the rlang package, and if you do that, it is relatively easy to manipulate formulae. It is one thing to exploit that formulas have scope to do all kinds of craziness, but what about using them for what they are designed for? Building statistical models. When we build a model with lm(y ~ x) the formula specifies what the response variable is and what the explanatory variables are. With most models, you have a model matrix under the hood, and formulas are just ways of specifying how that model should look like. Different statistical models do different things with this model (or feature) matrix, but as long as you have a formula and some associated data, you can get it. The model frame is a more complex object than the model frame, but we use it to capture the full data in a formula. we can overscope with that. Here, the x variable is the global x (that is how we constructed d), but the y column is the one we created for d.
You can use these functions to create models from a formula. That way, the user can specify how the model matrix is constructed and then your model-code is more general. 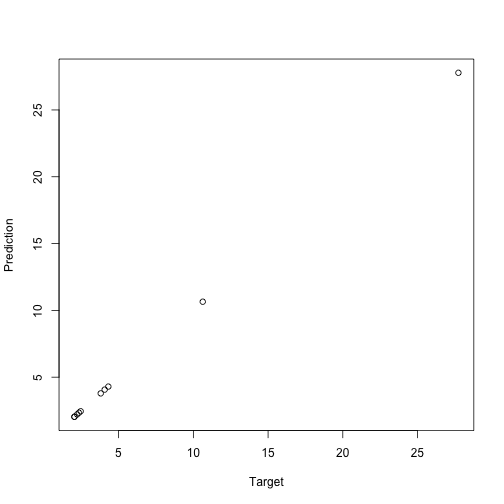 I have a more extended example in Advance Object-Oriented Programming in R, but here I will merely build a simple version of lm. When we fit a linear model, we construct the model matrix $X$, and then we fit it to the response variable $y$ using the expression solve(t(X) %*% X, t(X) %*% y. I will refer you to a statistics textbook if you want to know why. We take the formula we get as an argument, construct the model frame to get the response variable and the model matrix for the model fit. When we have the fitted parameters, we wrap them up in an object that carries the information we might want to access later. I will make a little more data for the models to work with. I kept the vectors short above so I could print them; I won’t do that now, but I will make them long enough to be interesting. I had to use the global_model formula here. If I had used the closure_model formula, I would still use the vectors from the closure and not the new ones I just made. The correct intercept is 2, the linear component is 0.5, and the squared component is 5. Our estimated parameters are not far off. When we fitted this model, it doesn’t matter if we used the closure or the global formula. The data parameter overscopes them anyway. If we want to predict the response variable on new data, we need to make a new model matrix from the new data. R does not enjoy making a model matrix from data that doesn’t have all the variables we have in the formula. Not even if is just the response variable, which we don’t need for the model matrix anyway. So we need to remove the response variable from the formula first. 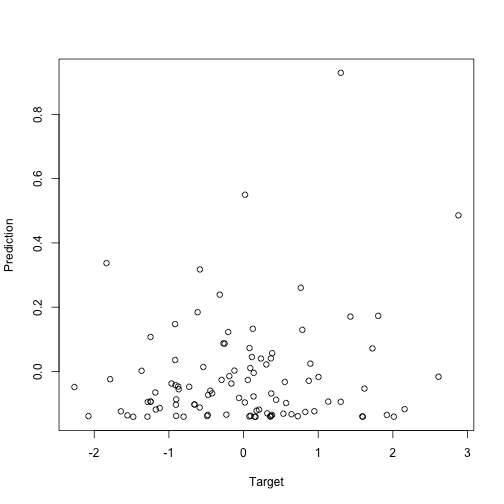 Other than that, getting the model matrix from new data is simple and so is using the fitted weights to predict new targets. # formula that does not include the response. # If we do include the response, we also need it in the new data. 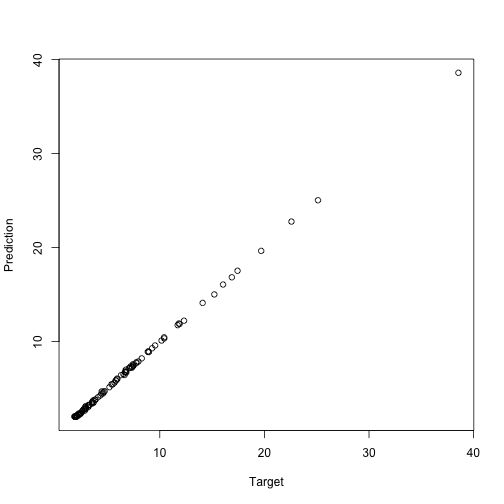 When we provide new data, we get the predictions from that.